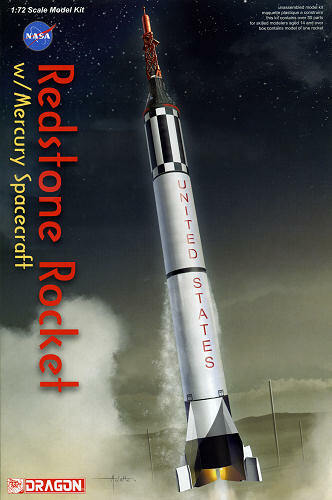 The Mercury-Redstone Launch Vehicle, designed for NASA's Project Mercury, was the first American manned space booster. It was used for six sub-orbital Mercury flights from 1960–61; culminating with the launch of the first, and 11 weeks later, the second American (and the second and third humans) in space. A member of the Redstone rocket family, it was derived from the U.S. Army's Redstone ballistic missile and the first stage of the related Jupiter-C launch vehicle; but to make it man-rated, its structure and systems were modified to improve safety and reliability. The four subsequent Mercury manned flights used the more powerful Atlas booster to enter low Earth orbit. Dragon is very much committed to providing the real space modeler with some fine kits and that continues with this one of the Mercury-Redstone. This kit's capsule does seem to have a window as used on many of the flights. There are markings for both Freedom 7 and Liberty Bell 7. One thing I did notice is that the lower part of the fins are solid (as in no 'cut out' from the steering portion of the fins to the booster body). I looked at this area as shown for all the Mercury-Redstone flights in Wikipedia and noticed that only rocket designation MR-5 and Alan Shepard's Freedom 7 seemed to have had this more solid look. I'm sure those who know more could chime in on this. The decals also have the little square 'MR7' markings as used on Shepard's flight. Grissom's would have had 'MR8'. Regardless, is nice to have this kit. Simplicity is the keyword for this kit. 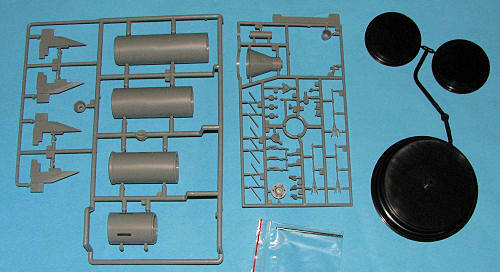 So basic is the kit in terms of parts, that the instructions and col or guide are printed on the back of the box. What one gets are four plastic tubes on which one attached the fins and the spacecraft. The spacecraft is a single mold as sanding a seam with all those corrugations would be quite a feat. The escape tower with its rocket on top will take up most of the building process. One builds up the lower section of the rocket, then the upper section, the tower, and the rocket pack, assembling them all in the last step. There is a nicely done plastic base (actually three of them but two are not required) and a metal rod on which to put the model. The lower stage has a reinforced area to accept this rod, thanks to modern slide mold technology. 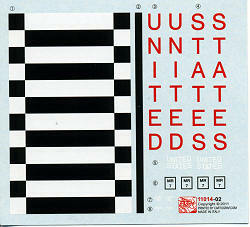 There are decals for one version and while the upper black and white areas are part of the decal, the lower stage sections will need to be painted. With such a simple construction, most of the build time will undoubtedly be used in painting as there is some masking to be done for the lower sections and the red capsule attachment ring. Looks like the overall model will measure about 14 inches which is a good size for these sorts of vehicles. Thanks towww.dragonmodelsusa.com for the preview kit. Get yours today at your local shop.